Raise your hand if fall is your favorite time of year! Woot Woot! It is mine and I think it is for a lot of people. While it is still pretty hot where I live, it’s September so to me that equals fall, no matter if the temperature tells me otherwise. And to me, fall also means it is the season of baking and baking lots of things with pumpkin, warm spices, and delicious breads. Now if there is one baked good weakness I have that no matter how much will power I think I have I could NEVER turn down, it is cinnamon rolls. Now, icing or cream cheese frosting, you might ask? Mini or ginormous? Raisins and nuts, or plain? Any and all of the above! I pretty much love it all. Now, my first and foremost reason for looking for a new cinnamon roll recipe this time was to find one that was eggless so my daughter could enjoy my favorite sweet treat as well. 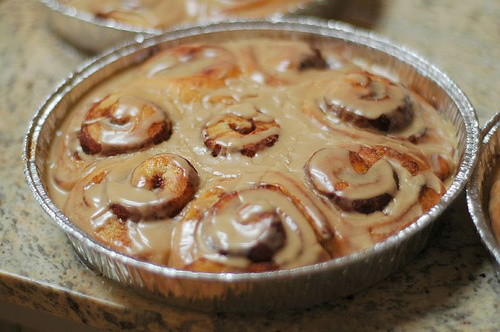 And never have I been more excited to come across a recipe that is not only eggless, but also turned out to be the best cinnamon rolls I have ever made. And it comes from one of my favorite people I go to for some of the best home cooking recipes, reminiscent of the food my mom made for us growing up: the one and only Pioneer Woman. The actual roll part is soft and delicious and the icing is really what sets these babies apart from other cinnamon rolls you’ve had in the past. It is a maple icing so this is truly heaven to me since it’s like combining my favorite treat with my other favorite treat—fresh maple bars. Does it get any better than that? The icing has powdered sugar, maple flavoring, milk, melted butter, brewed coffee, and salt. I actually left the coffee out since I’m not a coffee drinker and they were still out of this world. I’m sure the coffee just brings out the maple and other flavors even more and would make them even yummier! This is a really ginormous recipe that ends up making about 7 pans of cinnamon rolls so you can use your Cook’n software to decrease the recipe to make it more of a normal size for just one batch. For the dough, heat the milk, vegetable oil, and sugar in a medium saucepan over medium heat to just below a boil. Set aside and cool to warm. Sprinkle the yeast on top and let it sit on the milk for 1 minute. To assemble the rolls, remove half the dough from the pan/bowl. On a floured baking surface, roll the dough into a large rectangle, about 30 x 10 inches. The dough should be rolled very thin. To make the filling, pour 3/4 cup to 1 cup of the melted butter over the surface of the dough. Use your fingers to spread the butter evenly. Generously sprinkle half of the ground cinnamon and 1 cup of the sugar over the butter. Don’t be afraid to drizzle on more butter or more sugar! 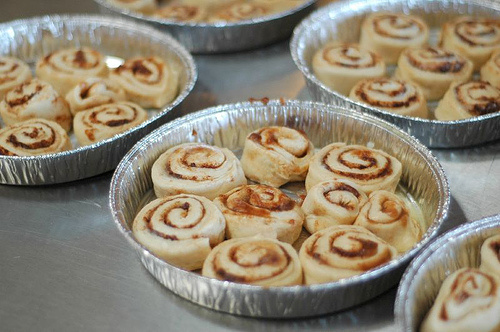 Gooey is the goal. Now, beginning at the end farthest from you, roll the rectangle tightly towards you. Use both hands and work slowly, being careful to keep the roll tight. Don’t worry if the filling oozes as you work; that just means the rolls are going to be divine. When you reach the end, pinch the seam together and flip the roll so that the seam is face down. When you’re finished, you’ll wind up with one long buttery, cinnamony, sugary, gooey log. Repeat the rolling/sugar/butter process with the other half of the dough and more pans. Preheat the oven to 375°F. Cover all the pans with a kitchen towel and set aside to rise on the countertop for at least 20 minutes before baking. Remove the towel and bake for 15 to 18 minutes, until golden brown. Don’t allow the rolls to become overly brown. While the rolls are baking, make the maple icing: In a large bowl, whisk together the powdered sugar, milk, butter, coffee, and salt. Splash in the maple flavoring. Whisk until very smooth. Taste and add in more maple, sugar, butter, or other ingredients as needed until the icing reaches the desired consistency. The icing should be somewhat thick but still very pourable. Remove pans from the oven. Immediately drizzle icing over the top. Be sure to get it all around the edges and over the top. As they sit, the rolls will absorb some of the icing’s moisture and flavor. They only get better with time… not that they last for more than a few seconds. Make them for a friend today! It’ll seal the relationship for life. I promise. What You Oughtta Know About Eating Late at Night! A New Twist on an Old Theme with this Healthiest of Fruits! What Do You Do With Too Many Tomatoes? New and Improved All Around!